Centers and Circle Time: Help! I'm drowning in stuff! Help! I'm drowning in stuff! It doesn't matter if you if it's your home or your classroom. Somehow, the accumulation of stuff can be enough to clutter your space and clutter your brain. An early childhood Educator, Michele wrote to me about how parents donate things to her all the time. I can only imagine what her resource closet must look like! For a year I taught in a church part-time and managed resources part-time. Surprisingly, I grew to love sorting through the clutter from teachers and creating a home for craft supplies, construction paper, toys, books, dress up clothes, sand, sensory table toys, dolls, and doll clothes. I found the peace and quiet rewarding after a day in the classroom with busy 3-year olds and then going home to my own children. I must say I'm not sure who began the church's resources system but I've never seen another as detailed since. Unfortunately, I do not have pictures of their resource room to share with you (yet) but here are some resource ideas to keep the clutter under control and allow you to concentrate on the most important part of your day...teaching! This is how I store my teaching items associated by month. These bins are available at Wal-Mart for $2. My books are organized by age-appropriate content. The bottom books are board books for babies to 2 years. The next shelf is for 3-5 years. The third highest shelf is for 5 and up. The top shelf are books and resource materials for Mommy and the very top shelf we use for games (I couldn't fit it in the picture). 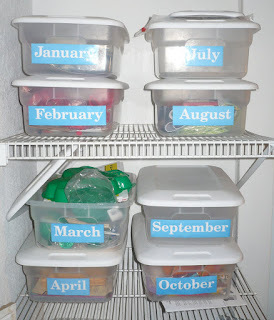 Here are some other ways I store...the green/red container holds my classroom Christmas tree and ornaments. One notebook hold stickers and the other is for my Centers and Circle Time business. The white crate is used for toys. The cute jar is for pen and pencils. And the pencil case is used for rocks and shells that go in my water table. Send me your awesome storage ideas and techniques and I'll post them. There are two types of storage that I worry about when it comes to preschool. The storage of my teaching materials and the storage of items I keep in the classroom on the shelves for my students. If my classroom shelves become to cluttered, then my students are not able to successfully put things away. If my teaching materials become too cluttered then I can't find what I need when I need it. Coming up with a system that I can keep up with is very important so that preschool is a rewarding rather than stressful experience for both me and the children. Thanks for sharing some of your ideas. Love your book shelves!! That is one area I have the hardest time keeping organized!! I always know I have books for a certain Holiday, Season, Theme, etc... then I cannot find them!! With 4 kids of my own who keep taking them, then the daycare kids hiding them so that only they can read them... it gets crazy!! I have a closet with those types of shelves... hummm... Thanks for the idea!! I am not worthy! You truly are the master...*giggling* and bowing at your majesty:) Thank you for sharing! Awww shucks CenterNCircle- you can call me Vanessa and I'm not a master, just a dinosaur :) I can remember a time when there were hardly any EC teachers on-line and now it seems they are flocking in droves- finally I have somebody to "play with" LOL! 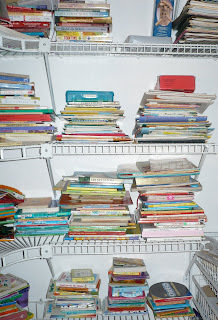 By the way, The kids have all bee taught how to care for books before hand- that's a must! oh, this is inspiring! i tend to start the year organized and then begin making piles and piles and piles. What the heck is age-appropriate anyway? Establishing Centers in "My Sad Class"